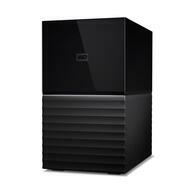 The My Book™ Duo drive has massive capacity ideal for storing photos, videos, documents and music. It’s super-fast with up to 360MB/s sequential read speeds thanks to WD Red™ drives inside and use of the USB Type-C™ port. That USB Type-C port with all cables included makes it universally compatible (supports USB 3.1 Gen 1/3.0/2.0). Two USB Type-A hub ports deliver flexibility for additional accessories.